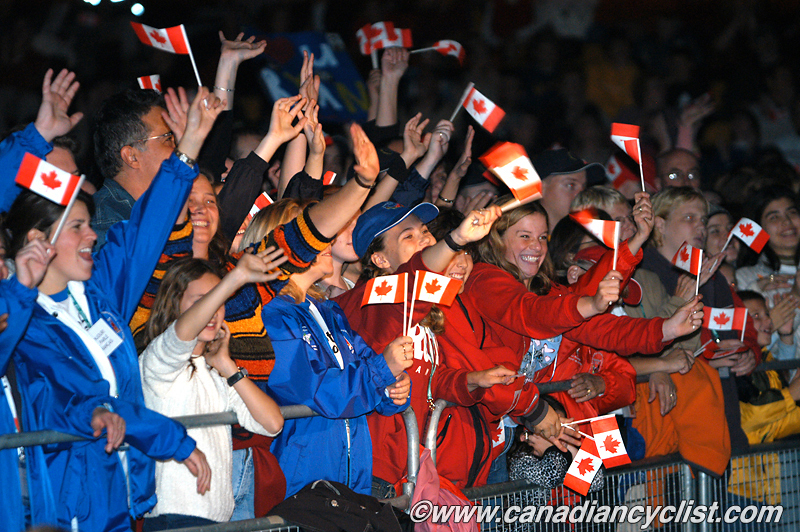 It was ten years ago this week (October 7-12), that Hamilton, Ontario, hosted the Road Cycling World championships - only the sixth time that the Road Worlds had been held outside of Europe (in 2010 Australia became the seventh, and the United States will host it in 2015). We felt that it was important to remember such an important event, and to see what - if any - impact it had on cycling in Canada. These remembrances are also interspersed with our own comments - I was the official photographer for the event, shooting from a moto all week, and we provided minute-by-minute coverage during the event, as well as during the years, months and days leading up to the Worlds. All spoke openly about the high and low points, revealing information that has not been made public before this. In fact, we have so much material, that this has become a three part article - pre-Worlds, the Worlds and post-Worlds. This is part two. The Worlds began with the Opening Ceremonies at the Copps Coliseum. As always, this event included lots of boring speeches and back patting among the politicians. 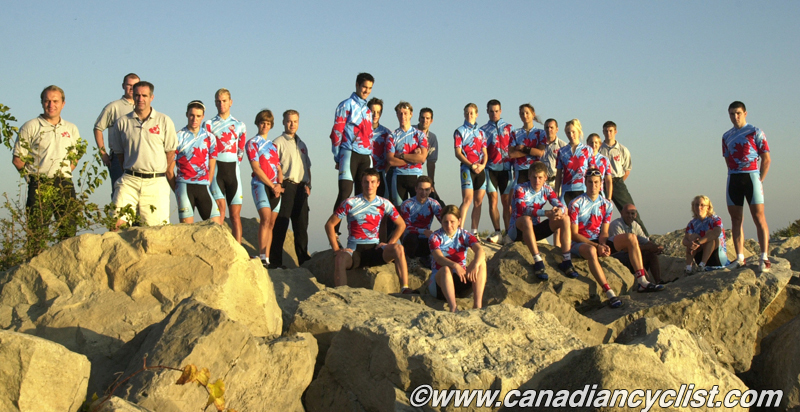 However, there was one different aspect that we [Canadian Cyclist] will take some credit for - the inclusion of past Canadian cycling stars. 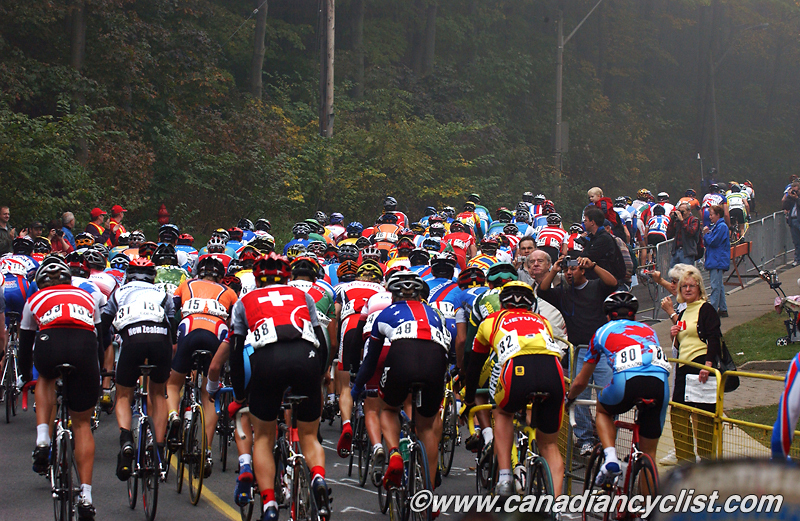 Racing began the next day with the time trials for three days, starting with the Junior Women and Espoir Men, and then finishing with three days of road races. It was the start of an incredible string of perfect Ontario Fall days - crisp, cool nights with sunny days and temperatures in the low 20s Celcius. The leaves were changing colours, and along the climbs and through the city it was the best it could possibly be. 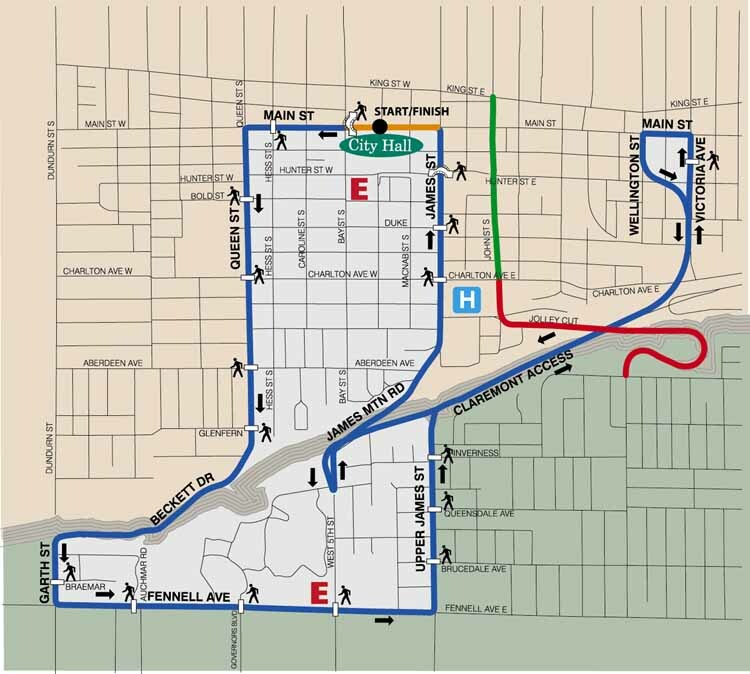 The courses - both Time Trial and Road Race - were wholly within the city, starting and finishing in the center of town in front of City Hall and the Football Hall of Fame. 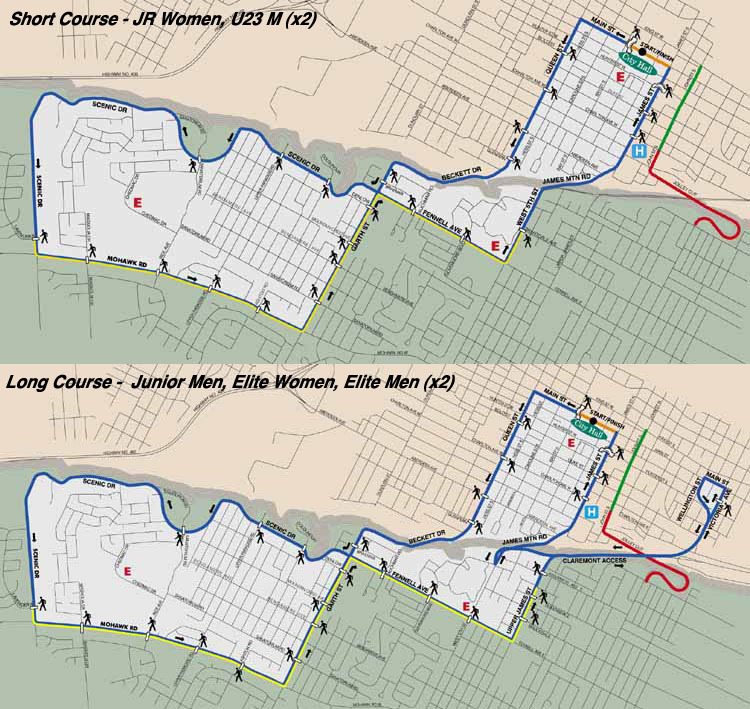 These days, this is completely unheard of, with races either starting in the city and heading out of town for circuits, or finishing on a circuit in town after starting somewhere else. "Closing down the city for one week was a real change," said Pierre Hutsebaut. "The city gave us one hour [each day] to put the fences up in the morning and one hour to take them off in the evening. I had 700 or 750 volunteers around the course to do that every day, to close down the city. It was a lot of coordination. It was too expensive to have employees do it, so it was all volunteer people. I must say that the people from Hamilton, they were ordinary people from Hamilton, they impressed me a lot by giving up so much of their time for one week. A lot of people booked one week off work to do this." "I know that one of the impacts was for the 2004 Olympic Games - they took the model of how we opened and closed the circuit. 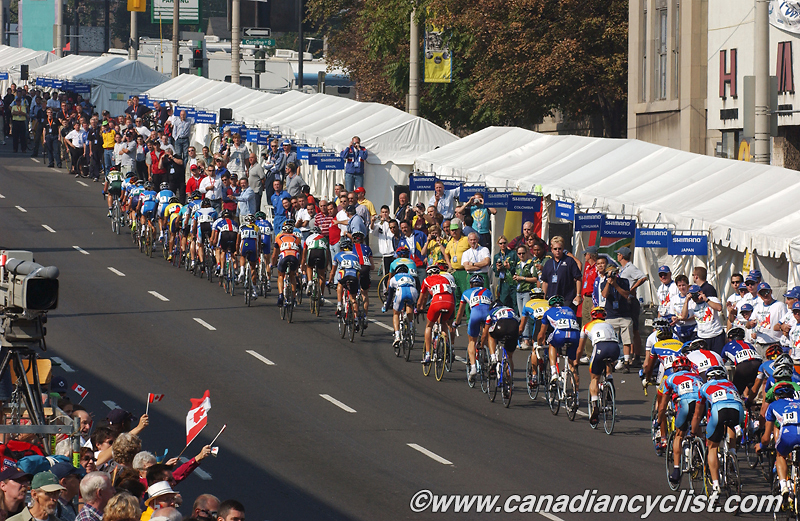 According to the UCI, it was the first time the world championships were held downtown in a big city. Before that it was always at the city limit, not in the core of downtown. They said to me later 'now we know it is possible to do it downtown and to bring the race to the people, and not the people to the race'." "But finally we did it and for the world championships itself, with so many people on the course, with the sun, the TV broadcast showing Lake Ontario, Hamilton and the surrounding area ... the outcome was incredible. The mayor came to me and said 'Pierre, this is the best thing that ever happened to Hamilton'. That is what I keep in my memory now. But I can tell you, [that the lead up in] 2001 and 2002 was not fun." There are some interesting names that pop up from the younger categories - the Junior men had Tony Martin, Rui Costa, Roman Kreuziger, Dominique Cornu, Lars Boom, Mikhail Ignatiev, Zdenek Stybar, Geraint Thomas, the Velits brothers, Andy Schleck ... this was a stellar year. 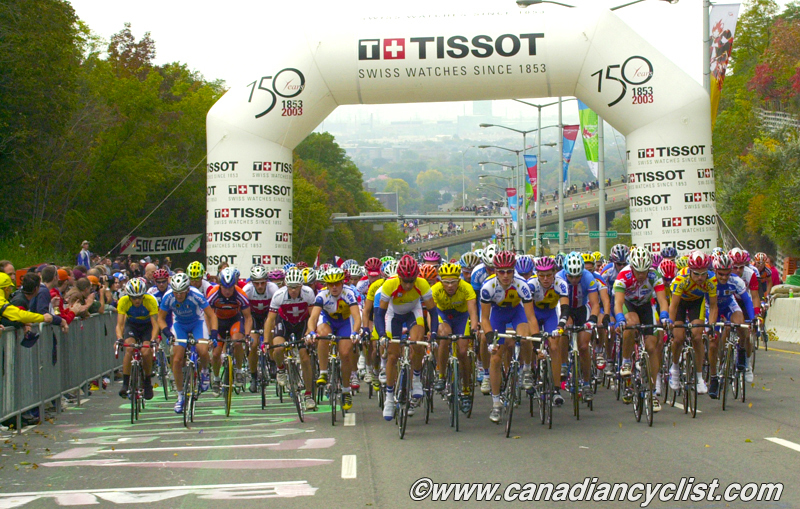 On the Canadian side, some young names we had included Kevin Lacombe and Christian Meier in Junior Men, Dominique Rollin and Martin Gilbert in U23 Men, and Emilie Roy in Junior Women. All of these riders went on to pro careers, with Meier and Rollin still racing on the WorldTour, and Emilie Roy switching to piloting a tandem in Para-cycling. For Canadian riders it was a special moment - to be able to race on the biggest stage before a home crowd. The crowds were tremendous, particularly on the two climbs. "It's still an amazing experience," says Sue Palmer-Komar, who finished 13th in the Elite Women's road race, in a chase group 19 seconds behind Swedish winner Susanne Ljungskog. Palmer Komar, in fact, lived (and still lives and teaches} in Hamilton "Normally your family doesn't get to see you race too much, because it's all over the place; in places they're not. Especially something like cycling that is so European-based. It was so special to have it right here, where they could see what I did. And the home town support, for once! You know ... in France they are cheering for the French, and for once we're in Canada and they are cheering for the Canadians." "I thought the Hamilton World Champs were very successful," agreed Eric Wohlberg, who represented Canada in both the time trial (25th) and road race (105th) for Elite Men. "I knew Pierre, Brian and their team put a lot of effort into bringing this event to Canada. It was a great opportunity for us Canadian riders have our family and friends come out to see us race and experience bike racing at the highest level." "I was excited to do both the TT and the Road race, even though I knew my chances were not that good. I had a very good National Champs on the course (winning the time trial), however, the day after Nationals, I was taken out by a car and broke my wrist pretty bad. Sadly the break was missed for a couple weeks as X rays were not picking up the fractures so I treated it like a sprain and continued to race and train." 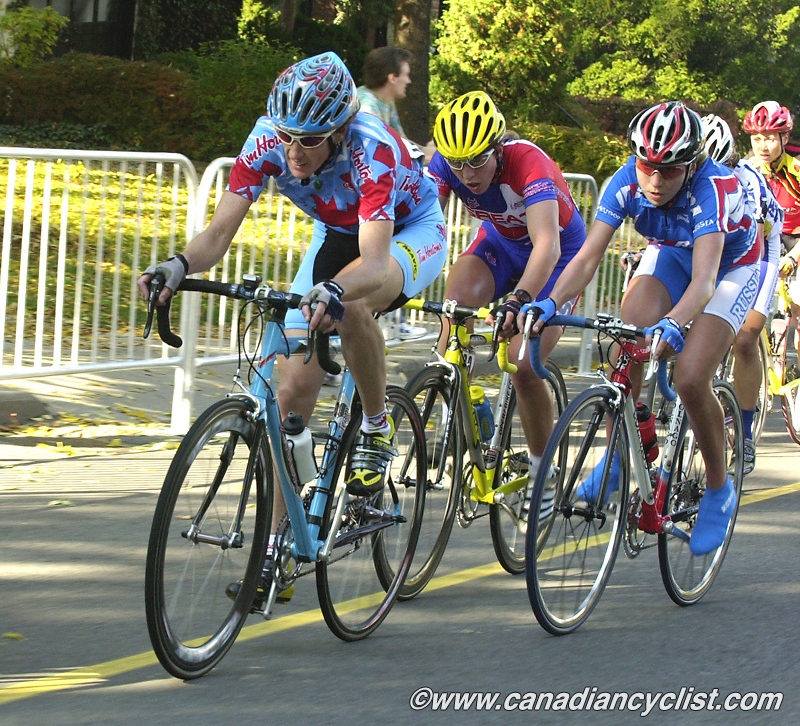 "I had to quit Gastown at BC Superweek due to wrist pain and I knew there was still an issue. It turned out I had two broken bones in my wrist. However, I was still riding well so I had a cycling specific cast made up and hoped for the best." "At the Championships, all the events were very well spectated and us riders were cheered on enthusiastically. I was not really happy with my result, but I went as hard as I could in the TT, and did all I could for the team in the Road Race." Jacques Landry, national Development Coach at the time, comments, "I was actually the Road Development Coach at the time, in charge of the Juniors and U23s. The first thing I always associate with those Worlds, was that it was the year my son was born, he was born about a month before Worlds happened. 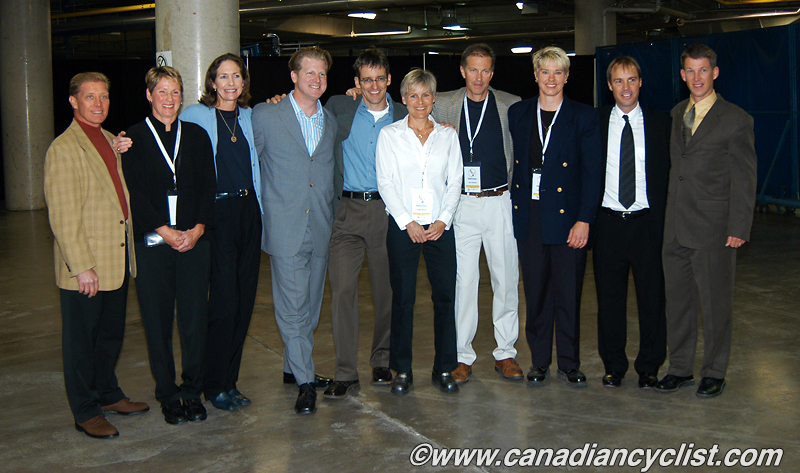 The Worlds themselves I remember being a well organized Worlds, the [Canadian] team had a really good set up there. The atmosphere was really good in the team, and the events went off, as far as we were concerned, without hitch." "The turnout [athletes and spectators] was pretty good for outside the European continent, a very good vibe, and it helped that the weather was pretty good too." "In the lead up that year it was a bit tricky for us, we could have done with more racing in Europe leading up, but then we would have just had to come back to North America. So we stayed in North America, but it just wasn't as competitive." I was on a photo moto for the entire week - something that a photographer rarely gets an opportunity to experience at the world championships (many go an entire career without the opportunity). There are always only two photo motos at Worlds - one is for the UCI photographer (Graham Watson), and the other for a photographer from the host nation. Me getting the moto made a number of European photographers extremely annoyed; there was a push by some of them to the UCI to get me off! My driver was former Canadian national champion Bruce Spicer, who did a great job, although I had to remind him a couple of times to slow down when we got airborne on some bumps.... 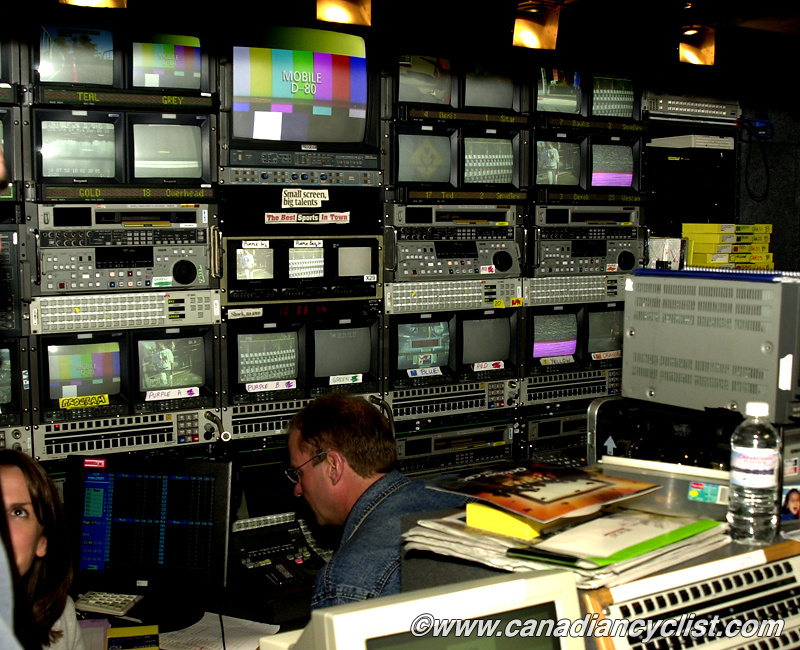 The officials were also a little more relaxed in those days - before TV became such a big deal - so we were able to get in a lot closer than is possible now, when the bikes get waved off constantly to avoid interfering with the TV shot. However, besides the great racing, there were some bad moments. For Canada, the worst day was on the penultimate one, Saturday, October 11th. 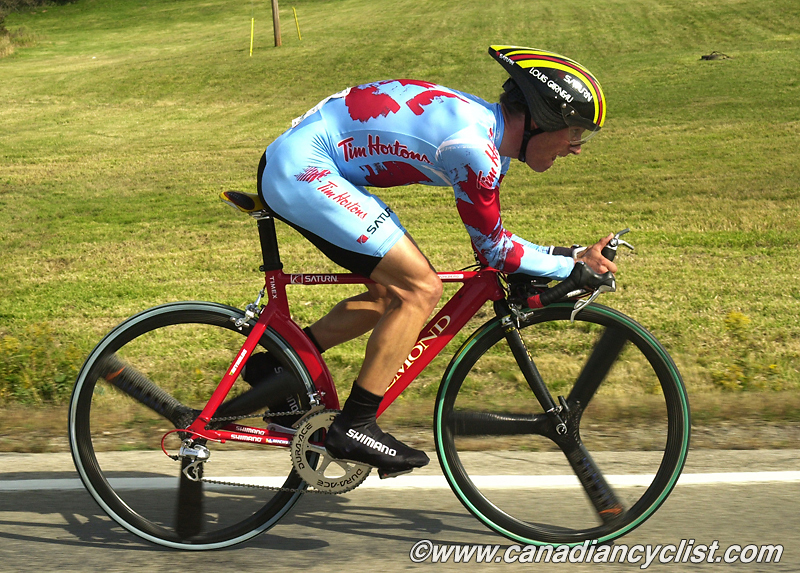 In the morning, Kevin Lacombe crashed badly in the Junior Men's road race. He was rushed to hospital in critical condition, after crashing face first and breaking one of the orbital bones above his eye, and would spend a week in the hospital. Jacques Landry remembers this well: "One thing that does stand out is a bad memory, when Kevin Lacombe had a fairly bad crash, so I spent a lot of time in the hospital, making sure everything was okay. Obviously, he pulled out of it fairly well, and had some other crashes since then. Unfortunately, it was the start of the string of bad crashes he had that made his career a lot shorter." 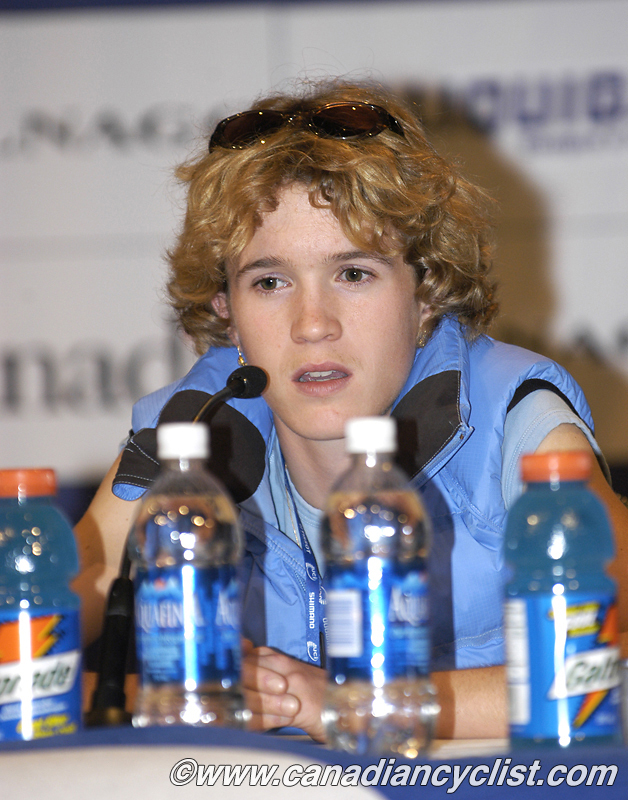 Overshadowing everything that day was the announcement that Canada's top prospect in the women's race, Genevieve Jeanson, had recorded a hematocrit level beyond the allowable 47 level and would not be allowed to start for health reasons. Within the knowledgable cycling world this resulted in some eye rolling - the 'health reasons' was the UCI's way of trying to control the rampant EPO use that was going on at that time, for which there was no test. Jeanson was eventually caught and admitted to doping, and was sanctioned, along with her coach Andre Aubut and doctor Maurice Duquette. 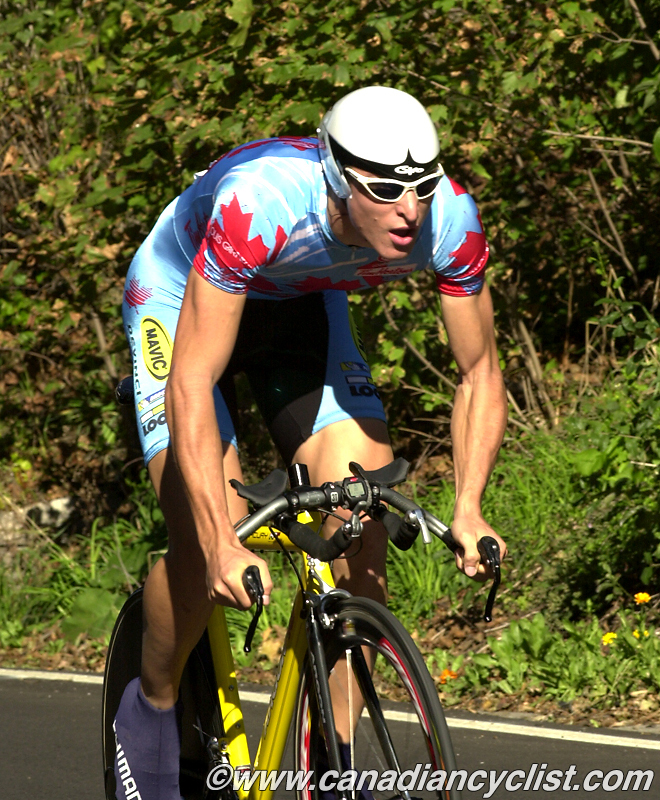 However, at this time, Jeanson was still a star of Canadian cycling, and considered one of the best chances for a Canadian medal at the championships. Bill Kinash had just become the President of the CCA leading into the Worlds, and his primary memory of the Hamilton Worlds is having to deal with this enormous public relations nightmare. "The Jeanson thing was such a black mark in my life. It really spoiled the day for me, it was the one day that my family came to the race and they ended up waiting in the hotel half the day, because I thought I was going to be able to get through this and watch some of the race. I watched not one minute of the women's race." "Somebody from the CCA office said to me 'Oh, we've got a crisis. We need you to come to the press centre'. We didn't have any plan in place on how to manage this. So, I went to the press centre and I spoke with Brian [Jolly] and Yury [Kacherin - national coach]. I went to the start of the women's race to wish the team well, and Genevieve wasn't there obviously, we didn't know where she was at that point. But I didn't have the whole story." "The UCI asked 'what are you going to do?' I remember talking with Enrico [Carpani - UCI press officer] quite a bit that day, and early on I realized that we needed a press release. So I drafted that up and then prepared for the press conference for after the women's medal presentation. It was a bit of scrambling to put together a plan on how we were going to address this situation." "Between Enrico and the media that were there, I was just trying to figure out what to do and say. I think it all worked out; it was my call to have the press conference and face the media there. There would have been a cloud hanging over us [otherwise]." "We essentially followed the rules [with the hematocrit suspension], and then Jeanson showed up half an hour before the press conference. I'd never met her, her coach was nowhere to be seen, there were a couple of people from Rona [her sponsor] there with her. So I approached her and told her what we were planning to do - by that time we had a pretty tight press release prepared - and asked her if she wanted to come and sit with us [before the press]. That was a black day in our history, obviously, it was the day we thought we had a chance at a medal." Our report at the time on the press conference can be seen here. It was no secret within the team that Jeanson was not close to the other riders. Her coach Aubut kept her isolated from the rest of the team - they stayed in a separate location from the rest of the team, and she had demanded that he be allowed to be in the team car, something that had been turned down for other riders. The riders actually met with team staff demanding that Jeanson not be given special privileges. "They told us before we left the hotel to go to the race. But I think we were all kind of focussing on the race, and we all wanted to go out there and get a result for Canada. Whether she was there or not; we had no control over that. I think that we just went out to race and it didn't negatively affect us because we all had our race to do, and we were also so committed to a Canadian result. That's all I remember: 'Well, she won't be racing with us'." Bill Kinash says that the racing created a very positive impression, "As far as the Worlds overall go, I think it was very successful. 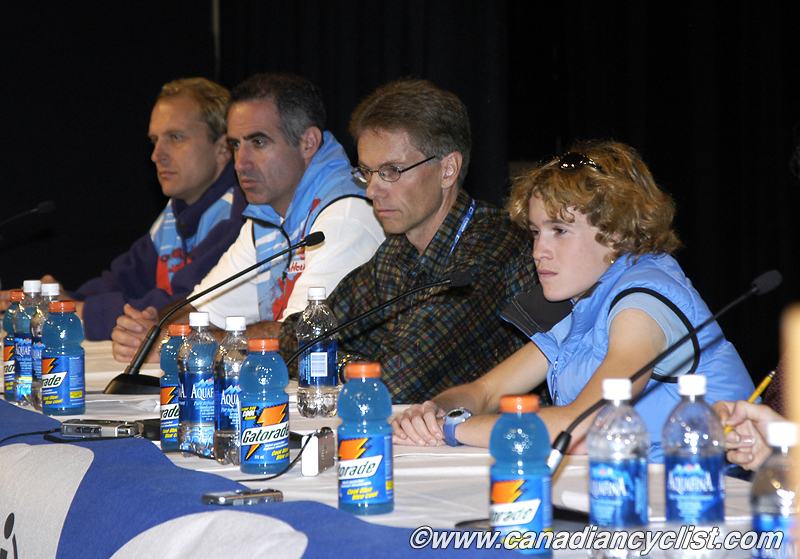 A year or two later at UCI Congresses, people were still coming up and saying 'that was a great Worlds'. From the men's road race it was very thrilling with Michael [Barry] being seventh [pauses and laughs ruefully] ... thinking about it, now another black moment. The racing itself was good and we had a great event. There were a lot of spectators crowded on the hill and it was an exciting finish." I can attest to Bill Kinash's feedback on the event - for a number of years I received comments from other members of the media about how great the Worlds were in Hamilton; and the media are pretty hard to impress! Kinash brings up another point with his comment about Michael Barry - this was the era when cycling was in a full-blown epidemic of doping, as has recently been exposed in the Lance Armstrong scandal and USADA reports. Barry was one of many riders who, it subsequently turns out, used banned substances during that period. Among others, David Millar, winner of the Elite Men's time trial, and Igor Astarloa, winner of the Elite Men's road race were both caught later for doping, with Millar being stripped of his Hamilton title. However, despite the retrospective pall cast on this time period by doping revelations, it cannot be denied that these Worlds were an immense success. I issued my final report card shortly after the event, and gave it an A-, a tremendous improvement from earlier in the year. 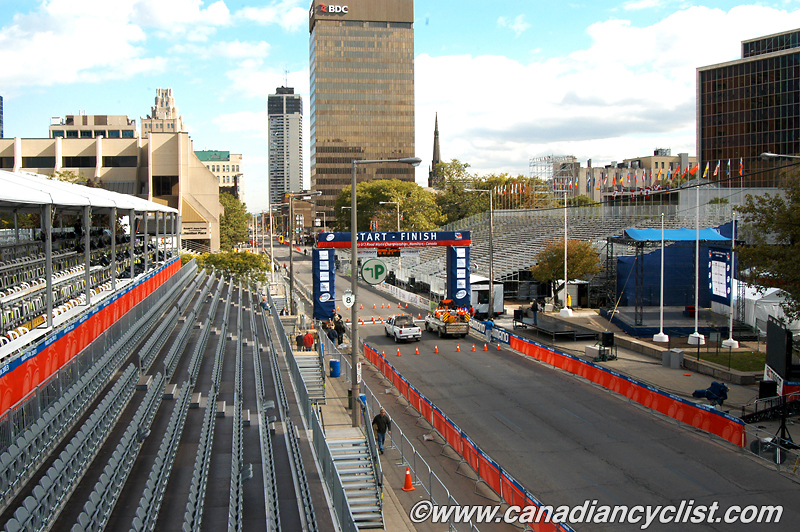 Our final report will be on the legacy of the Hamilton Worlds - was it just one week of great competition or, ten years on, is Canadian cycling still reaping the benefits?